If you are using the Google Analytics plugin for Joomla, or some custom built system to track individual users behavior in Google Analytics, you may want to take your “virtual stalking” to a whole new level of creepiness. All you have to do is create advanced segments based on Custom Variable values found in your Custom Variable reports — Don’t worry, they’re pretty easy and I’ll walk you through it. While I think it is more valuable to measure a segmented group, I can imagine plenty of scenarios where you may want to dig in and see precisely what a specific individual is doing. Lets get started! We are using the “New” Analytics interface. From there you will see a list of user names that are being tracked in Google Analytics. Find the user you want to track and copy down there user name. Give your report a good name. Something you will help you remember what the segment reports on like, “Virtual stalking Mr. Buttons”. Click the “apply” button and your done! 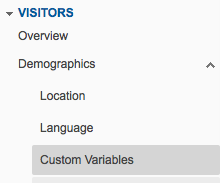 Now the only data showing in Google Analytics is from this one user. From here you can find out all kinds of detailed information about the users behavior on your site. For example, you can click “Content > Pages” and see a list of all of the page they’ve visited. The number of times they’ve viewed those pages, the time spent looking at each page, etc. This kind of analysis allows you to do very specific visitor behavior monitoring but be careful — You can quickly get into privacy issues. Make sure your sites privacy policies are up to date and that they allow for individual tracking. If you find the above method helpful, I’d love to here how and why your using it. Do you have privacy concerns with this level of monitoring? I’d love to here your reasons too! ← It Hertz when customers feel cheated!